Mondo, in partnership with Acme Archives, continues its insanely popular Star Wars Portrait Series by Mike Mitchell today with two new characters from a galaxy far, far away! 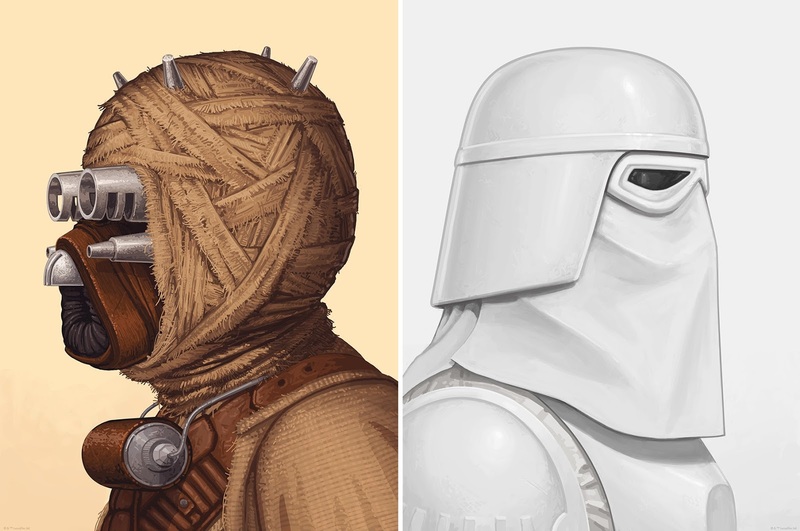 This release includes a Tusken Raider and a Snowtrooper, which originally debuted earlier this month at the Mondo Gallery's 5th Anniversary show “SWxMM”, an exhibit featuring artist Mike Mitchell’s character portraits of some of the most beloved heroes and villains in the STAR WARS universe. “Tusken Raider” and “Snowtrooper” by Mike Mitchell are 12”x16” hand signed and numbered Star Wars giclee portrait prints limited to 520 pieces each. These new Star Wars portrait prints will go on sale at a random time today, Tuesday, March 28th, at the Mondo online store for $60 each.